The debate moderator (who is supposed to maintain neutral during the proceedings), gives a supportive hug to Shawn McCraney’s wife immediately after she has ripped into Jason Wallace during the February 3, 2015 debate. Parts one and four of this series provide a timeline of Shawn McCraney’s descent from biblical orthodoxy into heresy. Parts two and three provide brief summaries of the issues in a Q&A format. Such summaries are necessary because the issues are complex and the vast amount of information contained in the timelines can be overwhelming. So with that brief introduction, let’s consider some of the more common questions that have arisen recently regarding Shawn McCraney, his teachings, and McCraneyism in general. Q: Is Shawn McCraney teaching that Jesus returned in 70AD? Starting on August 5th, 2014 in “Episode 406: Has Jesus Returned? – Part 1” Mr. McCraney taught a thirteen part series in which he took position that Christ’s second coming occurred in 70AD via a “spiritual” return. This is known as “Full Preterism”. If all was fulfilled, then we can say that prophesies of the restitution of all things were fulfilled too. And since Jesus would return when the restitution of all things would occur we can say that His return was at the destruction of Jerusalem in 70 AD. I would suggest in 70 AD, when Jesus returned in the clouds with judgment that at this time all who were in the prison part of hell stood before the Great White Throne of God to determine if their names were written in the Lamb’s book of Life, and those whose names were not included were cast into the lake of fire. That was the state of all who died before Christ and went to the prison part of sheol. As an aside, I would suggest that with everything being wrapped up with the house of Israel in 70 AD – including God dealing with those in prison, that now all people individually process through a similar system after life. Believers go straight to paradise by His grace through faith. And those who die without faith go to hell (for a period of time) they are released and judged by the Lamb’s book of life and some escape experiencing the Lake of Fire but others do not, and again, this all occurs on a case by case basis. So there it is – my estimation of when the Bible says Jesus would return. Thirteen segments. I want to thank all the brave preterist’s who have endured countless attacks and dismissals for their work in this area. These people include my brothers Don Preston, Glenn Hill, all who contribute to the preterist archives online, my dear brother Mark Payzant, the support of my wife and family who too have had to challenge many of their long held notions to clearly see the forest for the trees. Q: Is Shawn McCraney teaching that hell isn’t eternal and that those who are unbelievers in this life can be reconciled to God after death? Immediately following the series on Full Preterism, starting on November 11, 2014 with “Episode 419: Eternal Punishment – Part 1” Mr. McCraney taught a six part series in which he taught what he is calling “Total Reconciliation”. The idea that once a person dies the hope, and chance, the ability to change is lost and that people are forever relegated to an eternity of punishment has never made sense to me relative to how the Bible describes God and the love that He is. As a human Dad, a weak evil father of three daughters, I comprehend punishment and discipline, I understand allowing troubled children to run their course and to leave them to their own devices. I get letting my children make a mess of things in order to let them learn and turn and grow and change. But the idea of ever turning from a child completely is totally foreign to my thinking. And if I am able and/or willing (by God’s grace) to forgive and receive all people no matter what they have said or done or believes wouldn’t God almighty be infinitely more willing and capable? Could it be that reprobate believers, at death, enter the smelly bottomless pit as a means to purge or teach or help them reflect upon their lives? To wonder of their fate? To cause them to cry out to Jesus as I’m sure Jonah cried out to God to be delivered out of the belly of the great fish? And can we imagine the joy such failed believers would experience after coming out of the pit and then standing before the great white throne to hear that their name HAS, in fact, always been included in the Lamb’s book of life? I cannot figure out any other reason for who has been in hell to have their name written in the Lamb’s book of life other than they had at one time truly believed on the Lamb . . . unless unbelievers names who call out to Jesus while in hell are added to the Lambs book of life – which in the end support my argument for Total Reconciliation even more. In either case I would suggest that we are witnessing God reconciling people after this life by having some who have experienced hell being saved from the Lake of Fire. Q: OK, so what’s the big deal? Neither of these seem so bad to me. A: Both Universalism and Full Preterism contradict the bible and can lead to other error. Universalism is heretical if it teaches that that there’s another way to be saved other than by faith and trust in Jesus Christ and His atoning work on the cross. To be clear this isn’t what Shawn McCraney isn’t teaching but it has been asserted by some that the form of universalism that he’s teaching is leaning precariously close to such a stance. Universalism is not Just. If evil is not judged, then how is Justice served? If someone does not want to go to heaven, is it just to make them? Do Satan, Adolf Hitler and Mother Theresa deserve the same future? Or do Universalists deny Justice? Universalism violates individual free will. C.S. Lewis said, “There are only two kinds of people in the end: those who say to God, ‘Thy will be done,’ And those to whom God says, in the end, ‘Thy will be done’ All that are in Hell, choose it.” If hell is for those who choose it, then by saving everyone God violates our free will. Universalism soft pedals, reinterprets, and/or denies the basic teachings of Jesus about hell. Jesus spoke about hell more than any other figure in the Bible. Example: “…so it will be at the end of the age. The Son of Man will send out his angels, and they will weed out of his kingdom everything that causes sin and all who do evil. They will throw them into the blazing furnace, where there will be weeping and gnashing of teeth” (Matt. 12:40-42 NIV). Or, “Then he (the Son of Man) will say to those on his left, ‘Depart from me, you who are cursed, into the eternal fire prepared for the devil and his angels’” (Matt. 25:41 NIV). And many other verses. Universalism eliminates the need to accept Christ. Even though Jesus cited the need for people to believe in Him, if everyone gets saved, why bother? 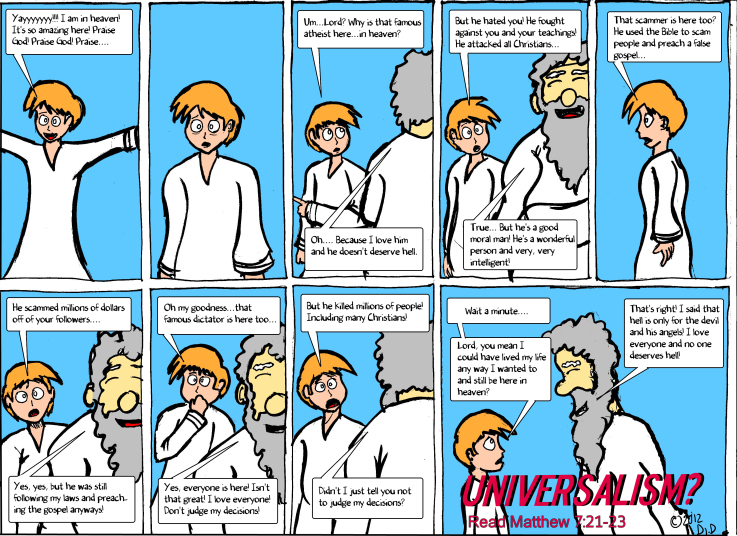 Universalists ultimately believe there is no need for a person to follow Christ. Even blasphemy cannot damn someone, so why bow to the Nazarene? Universalism strips the Gospel of its power. If everyone goes to heaven, exactly what is the Good News of the Gospel and why do people need it? Better News (at least from the Universalist’s perspective) is that you don’t need the Good News to be saved. Universalism can give someone a false sense of security. If you’re going to be saved no matter what, there is no need for accountability, repentance, faith, or moral effort of any sort. You are eternally untouchable and have nothing to fear. Love wins, so why worry? Universalism can have eternal, irreversible ramifications for its adherents if it is not true. Similar to Pascal’s Wager, I am better off living as if Universalism WAS NOT true and being proved wrong, than living as if Universalism WAS true, and being proved wrong. In the first count I will still be saved, in the second count I will not. Universalism undermines the uniqueness of Christianity. If everyone goes to heaven, then the road is NOT narrow, like Christ taught (Matt. 7:13-14). Buddhists, Hindus, Muslims, Scientologists, Satanists, even Atheists, will all be saved. So what compelling reason is there for Christianity? Universalism eliminates the need for evangelism. If everyone goes to heaven, then Christians should apologize to the world and bring all our missionaries home. What is the purpose of turning someone from paganism, mysticism, satanism, or cannibalism, if love wins? And, no, the irony of an ExMormon teaching that the dead can get a second chance after they’ve died hasn’t been lost on many of Shawn’s critics. Some have even joked on social media that he’ll be teaching proxy baptism for the dead next. As discussed in last year’s “Dear Michelle” article, Mr. McCraney’s theology is looking more and more like nothing more than a recycled form of Mormonism. The problems with [full] preterism are many. For one thing, God’s covenant with Israel is everlasting (Jeremiah 31:33–36), and there will be a future restoration of Israel (Isaiah 11:12). The apostle Paul warned against those who, like Hymenaeus and Philetus, teach falsely “that the resurrection has already taken place, and they destroy the faith of some” (2 Timothy 2:17–18). And Jesus’ mention of “this generation” should be taken to mean the generation that is alive to see the beginning of the events described in Matthew 24. Eschatology is a complex subject, and the Bible’s use of apocalyptic imagery to relate many prophecies has led to a variety of interpretations of end-time events. There is room for some disagreement within Christianity regarding these things. However, full preterism has some serious flaws in that it denies the physical reality of Christ’s second coming and downplays the dreadful nature of the tribulation by restricting that event to the fall of Jerusalem. Q: You said that those teachings “can lead to other error”. What do you mean? A: The Full Preterist tendency to hyper-spiritualize things, I believe, has lead Shawn McCraney into the heresy of gnosticism. God primarily related to the Nation of Israel, and then through the promised Messiah, and then His chosen apostles physically and that once Jesus came [in 70AD] and heaped judgment on Jerusalem (while saving the Church in that day) that God now relates to the world spiritually. In other words, today Christ’s kingdom is spiritual and it is known and perceived by the Spirit – and not the things of the flesh. When viewed in this manner we begin to see how the baptisms that John the baptist performed were so utterly inferior to the baptism of the Spirit (and of fire that Jesus would bring) that it caused the baptist to admit that he wasn’t worthy to even tie the man’s shoes. The Bible, pure and simple, is a history of this physical economy but sprinkled through the New Testament narrative are passages that directly speak to this ultimate end of the Kingdom of God living and abiding in the heart of the individual and not in brick and mortar edifices under flesh and blood authority. And if the reader has any lingering doubt that Mr. McCraney is teaching pure, unadulterated gnosticism, I would refer them to the series on the Bible starting with the January 13th, 2015 “Episode 428: The Bible – Part 1” broadcast. Just compare what he’s teaching in that series with the description above and see if they match. Q: Aren’t Christians supposed to love everyone? So why are critics criticizing Jed (who is a member of Shawn’s church) for asking Pastor Jason Wallace if he loved him? A: Because it was clearly an agenda driven, pot stirring setup. This event occurred @1:28:41 in the February 3rd, 2015 debate between Pastor Jason Wallace and Shawn McCraney. Before proceeding please watch it for yourself by clicking here. As both the moderator Mark Payzant and Shawn McCraney stated well before he took the mic, Jed is trouble. He is a known pot stirrer, instigator, and provocateur. Further, both the question and the behavior was inappropriate given the setting and context. This was a formal debate not a soapbox for Jed the Shawnite to advance his personal agenda before a worldwide audience on. You will notice, for example, how Jed first rallied public opinion via show of hands demagoguery and then turned on Jason whipping those sympathetic to his agenda into a frenzy. In other words, Jed got exactly what he wanted. Christ was willing to accept what Peter was willing to give because it was sincere and not hypocritical. Yet Jed and the rest of the Shawnites in the room were demanding something of Jason Wallace that even Christ didn’t demand of His own chief Apostle. Further, please consider this bible verse: “I loved Jacob and hated Esau.” (Malachi 1:2-3, The Message) The person speaking is God. What kind of “Christian” are we to make of Him? After all, aren’t Christians supposed to love everyone? If Esau had been asking the question to God instead of Jed to Jason and gotten the response that God gives in Malachi would the Shawnites have jumped on God the way that they jumped on Jason? Does Jason Wallace have Jed’s best interests at heart? Yes, I believe he does or he wouldn’t have taken the time and effort to show up at Shawn’s studio and debate him. And what he did was warn Jed and the other Shawnites in attendance and watching worldwide via the internet that they’re following a false teacher and that they’re in a cult. So, yes, in that sense he showed that he loves Jed by his actions. However, does he have “phileo” love for Jed? No, I doubt it because, as he said, he hardly knows him. But if you love those who love you, what credit is that to you? For even sinners love those who love them. And if you do good to those who do good to you, what credit is that to you? For even sinners do the same. And if you lend to those from whom you hope to receive back, what credit is that to you? For even sinners lend to sinners to receive as much back. But love your enemies, do good, and lend, hoping for nothing in return; and your reward will be great, and you will be sons of the Most High. For He is kind to the unthankful and evil. The most unloving thing that Jason Wallace (or any of the critics of Shawn McCraney and McCraneyism) could do would be to let Shawn and his followers continue in heresy and error and say nothing. It’s no different than the love that Christians show Mormons by speaking up against the errors of Joseph Smith and Mormonism. If the folks at CAMPUS really loved Jed, in my opinion, they would confront him about his public behavior rather than praising him for it. They would challenge him to stop his childish and immature pot stirring – like calling Jason Wallace’s show and picking fights and grandstanding in front of the cameras. In my opinion, if they truly loved Jed they would have talked to him immediately his public antics at first Inquisition 2014 and then again after the recent debate show. And if he didn’t listen then the second half of Titus 3:10 would apply. But no, instead, they continue to give him a soapbox and then praise him when he engages in socially inappropriate – even downright embarrassing – public behavior. So in the end, and in my opinion, Exhibit A for how little love Shawn and the folks at CAMPUS really have for fellow Christians is Jed. If they truly loved him they would care enough to confront him and challenge him to grow and mature. Again for emphasis: “If they still refuse to listen, tell it to the church; and if they refuse to listen even to the church, treat them as you would a pagan or a tax collector.” Essentially Christ is saying that the person should be treated like an unregenerate sinner who’s not a Christian. Is that harsh? However, such treatment is in the person’s best long term interests isn’t it? So tell me, was Christ teaching something that’s unloving? 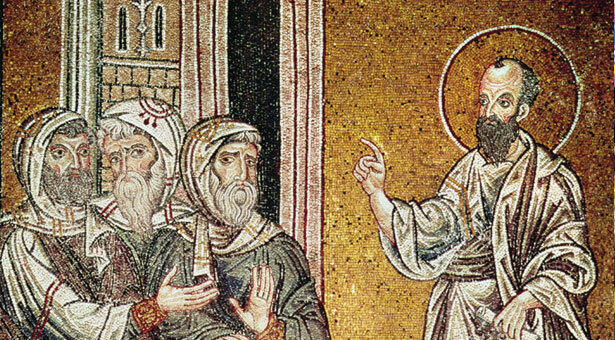 Was He telling His disciples to be “haters”? And I can keep going, this is just a sampling of what the bible says about church discipline and order. Simply put what Shawn McCraney is teaching and what CAMPUS is practicing simply isn’t biblical. Further, I can speak from experience about how this is supposed to work since I am a recovered alcoholic, drug addict, and the beneficiary of godly church government who cared enough to confront. I am clean and sober today because fellow Christians (including several church leaders) loved me enough to confront me about my addictions. Would it have been more “loving” for them to leave me in self deceit and sin? Would they have been loving me if they’d let me continue to abuse the bible to justify my sinful behavior? Would it have been “agape” to let me drink and smoke myself into an early grave? Would it have been “agape” to let me continue to spew insane rationalizations (some of which were public) as to why I was doing nothing wrong and they were the problem? The answer is no. That wouldn’t have been “agape” at all! Thankfully I had Christian brothers and sisters who loved me enough to confront me with the truth so I could get “unstuck” and move higher up and higher into God and His Kingdom. I just wish Jed did. “What is the preterist view of the end times?” GotQuestions.com website. Bracketed note added for context clarification. NOTE: if you have a question about Shawn McCraney’s slide into heresy that wasn’t answered here, please look through parts two and three of this series, it’s very possible that it may be answered there. I am the most unbiased person that could comment. I have no axe to grind. I have watched upon request of a friend who was knee deep into McCraney. But I have done tons of reading and youtubes on The Inquesition and right up to now. Im in my early sixties and was somewhat where Shawn is years ago minus a TV show. My input would be, Shawn, God loves a humble heart. God loves people who Walk in The Spirit. If you humble yourself, God will still be able to rebuild your vision. If not, He won’t .You have taken on The Church. If you remain headstrong you will create “another congregation, or God forbid, a denomination. Your personality reminds me of George Verwer, the founder of Operation Mobilisation, but you took a wrong fork. My Maria Moonbeam satirical skit, which I made around 1991 . . . came from an observation I had long made about a certain hypocrisy. In this case, Maria (Muh-RIE-uh) is a spokesperson for “The Coalition To Enforce Peace For The Planet” or something like that . . . and she carries on about how it will “have to be woman who save the planet” because they alone are nurturing, peaceful and loving, while “men only know how to hate and destroy.” Maria then goes on a hate-filled tirade, filled with violent epithets and threats. . . .
And many now notice how it seems to be that those who talk the most about tolerance and equality, passivism, non-violence etc., are the most intolerant, judgmental, cruel and (verbally, at least) violent people in the bunch. Shawn McCraney makes a good object lesson for a similar tendency among certain professed Christians, and he is a public figure, so again is a useful example to discuss, I believe. Like many other “liberal” . . . “post-modern” . . . anti-church “Christians”, he posits that what Jesus and Christianity is primarily about . . . is “love.” Shawn carries on and on about how “it’s all about love” . . . “agape love” . . . while I must note that I have never felt more lurking violence and antipathy in any professing Christian “pastor” or “teacher” of those I have met. For someone who claims that it’s all about love and loving each other, I can only say this. When he came at me, after I questioned him on some errors I thought he was making, the spirit I felt in return was so menacing and aggressive that I was left physically shaken . . . in a way that I can’t recall feeling for many years, maybe since grade school when I was the “new kid” and being targeted by older, bigger bullies. It seems to me that the kind of “love” that Shawn and those like him promote, which appears to be the same as the post-modern culture is currently forcing down everybody’s throat is, “you must accept and ‘love’ and even revere everybody no matter what they do, say, believe, promote. There can be no discernment, no ‘discrimination’, no ‘judgment’. Any and every thing goes.” That’s what “love” is. The nominally “Christian” of this mindset claim this is “agape” love–the highest kind of love. But I think this is a big mistake and a cover for something else. It is easy to say, “God is love” and that “love is the most important thing.” But what is “love”? Does love never judge? Does love never chastise? Does love allow everything? That can’t be. If it is, then what was the point in God forbidding the eating of the tree of the knowledge of good and evil? Why, when God’s command was rejected, did He bring the curse of death? Why, throughout the Old Testament, did God warn His chosen people not to do certain things and behave in certain ways . . . if “love” really means that every thing and every one must be accepted and celebrated with no conditions? If God is love–the kind of “love” that the liberally-minded insist He is–then how to reconcile that sometimes He ordered the destruction of whole peoples, cities, even the very earth, in effect, via the flood? Well, these of course are the very objections that atheists and other religions make against Biblical Christianity. “What kind of God/love is this! ?”, they accuse by their question. And how can a “loving” God send some people who don’t conform to an eternal Hell–to eternal punishment? But what is all too obvious in this, is that, rather than submitting to what the Word of God actually teaches . . . such a person instead “leans to their own understanding”. Oh yes, God loves. He is love. But what this really means is what is at stake. God loves his people, He loves righteousness which reflects His glory; but He HATES sin. It is BECAUSE He loves, that He meets out judgment on the rebellious–that He chastises those He loves. It is BECAUSE He loves . . . that He must punish and make testament forever that which is contrary to His nature and supreme will. That “love” which, for instance allows a child to do whatever the child wants . . . is not “love” at all. The truly loving parent corrects, guides, chastises when necessary, out of a real, deep love of the child, knowing ends from beginnings. The parent who does not love a child so much allows the immature one to fall into any and all mistakes and destructive courses. In the recent example, I would say it is because Jason Wallace LOVES the Truth, and genuinely cares for (and loves) Shawn . . . with a kind of parental love . . . that he must challenge and warn as he has, that Shawn is delving into dangerous territory. If Jason did not love the Truth or Shawn, he would not bother. Go ahead and let Shawn take himself and others off the cliff, who cares? The worldly . . . and the clearly rebellious (against the Word of God) are storming all about the culture nowadays demanding that any and all beliefs, worldviews, behavior . . . be tolerated and even celebrated, otherwise “you are not being loving”. But notice how this includes virtually all beliefs and worldviews EXCEPT the classical Biblically Christian one. When the world finds favor in you, you know you are most likely on the wrong track. Everyone is “loved” and accepted . . . except the Bible-believing Christian. Yet, what is shown time and time again, is that it is the Bible-believing Christians who love souls and the work of God enough to confront error, to confront the debased, anti-Christ culture, putting themselves in harms way, taking the slings and arrows from all sides! THAT is real love, though the world calls it hate and “jugdmentalism”. Just as a person does not want to change and “fundamentally transform” something or someone they love (ie., a country) . . . but love them as they are . . . so too does the true believer not attempt to change or fundamentally transform what the Word of God says or His nature and ways as He has revealed them. Real love, agape type love, takes God for Who He is and goes from there. It is does not start from one’s own ideas and speculations of who or what God should be like. That is only love of self–idolatry–love of one’s own god made in the image of one’s self. Thats so exactly right. Shawns clan calling Jason on not being loving set the trap for Shawn if anyone noticed. He displayed such an unloving Spirit farther down the trail!! And thats what ALL his “Laws And Prophets” hang on. And his deceived followers called him a martyr. I so admire those who took time out of their schedule and flew down to try to help Shawn back on track in such a loving way! In a way Im really glad this was so public and the reason is many mormons will have been watching and already aware of some shakyness in his theology, and particularly in his “loving” attitude. Its not to late. Many have fallen and few worse than David. That means theres hope if he humbles himself. I have been studying “The Spirit Filled Life” and it would be so good if he would do the same! But I don’t know how you decide which scripture to quote if you claim Christ returned in 70 AD. Maybe thats why he was weak on giving scripture. And how could he give the ones he did, from that standpoint. Too bad, so sad. PS It was extremely ironic that he was caught using JW quotes to back his theology!